The USCF Election will take place in a few months. There are six candidates for three positions. The candidates are: Beatriz Marinello, Mikel Peterson, Don Schultz, Sam Sloan, Tim Hanke and Dr. Joseph Wagner. I know all but one of the candidates personally and I feel that all of the candidates are good. There are no bad candidates (unlike in some previous election years). However, thus far there has been very little discussion of the issues. I would like to start a debate by pointing out some issues. It seems virtually certain that the USCF will move to Florida. I am in favor of a move, but not necessarily to Florida. From the beginning, I have felt that New Windsor was a terrible location and that the USCF should never have moved there. However, I am opposed to a move by the USCF to the headquarters of Excaliber in Miami, because of the conflict of interest in that Excaliber manufactures products which the USCF sells and that deal would make the USCF a tenant in a building owned by Excaliber. The Palm Beach Gardens deal seems to be the best deal the USCF will ever get and I feel that we should take it. I do not believe that Tim Hanke has come out for or against a move, but he has stated that he would like for the USCF to remain in New York or in New England where he lives. Don Schultz is one of the main architects of the move to Florida and of course he is in favor. None of the other candidates have expressed an opinion on the move to Florida, although since Mikel Petersen lives in Florida, he is likely to be in favor of the move. The current election is the first election under OMOV, which means One Man One Vote. I was surprised when Tim Hanke stated a few days ago that he had changed his mind about OMOV. Whereas he was previously in favor, he is now against it. 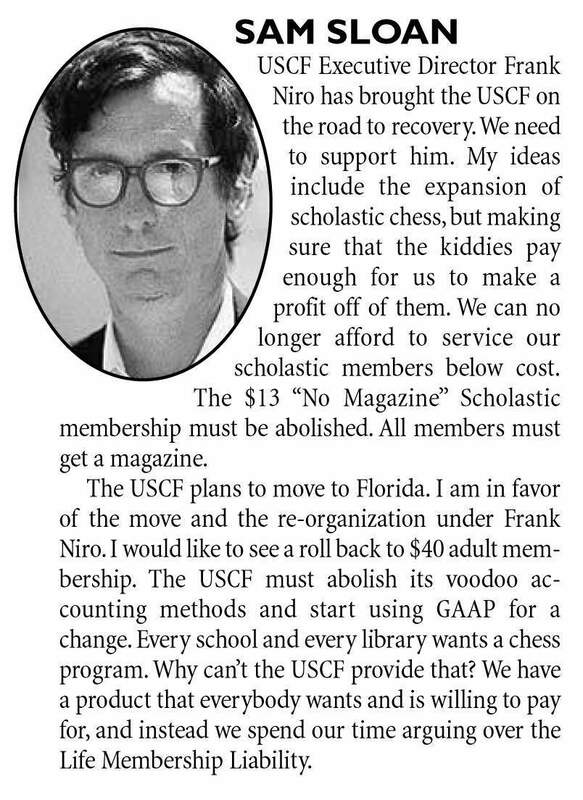 I am opposed to a no magazine option to USCF membership. It is a great benefit to the USCF to be able to send a magazine to its members. Also, if a cheap no magazine membership were offered, regular membership would drop and Chess Life might either fold or have to be dramatically reduced in size. Tim Hanke is pushing a no magazine membership or a tournament membership, although he had not suggested prices for these memberships. The difference is critical, because the USCF already has a no magazine membership for $39. I am not aware of any other candidate expressing an opinion on a no magazine membership, but I assume that most if not all of the others are against it. Tim Hanke and I are completely against drug testing. One candidate has been in favor of drug testing in the past, but I am unaware of his current position on the issue. OK. So these are the only contested issues so far of which I am aware. Any comments? ?